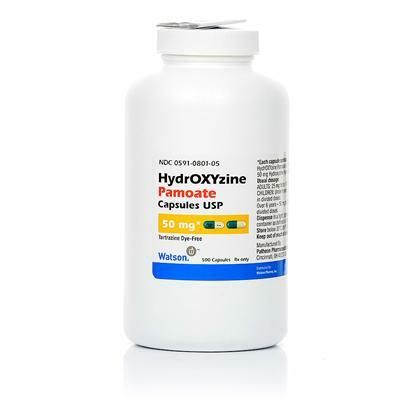 Hydroxyzine is an antihistamine used in dogs to treat atopic dermatitis, used in cats with symmetrical alopecia of an allergic origin, miliary dermatitis and eosinophilic granuloma complex. It is helpful for relief of itching and usually works within 20-45 minutes. Hydorxyzine can be combined with other medications such as corticosteroid in cases of severe itching. Dosages for Hydroxyzine vary depending on the type and size of the animal so always be sure to administer the proper dosage. See directions below and your package instructions for details; always follow your veterinarian's prescribed dosage if it differs from the standard dosage recommendations. Hydroxyzine is well tolerated by most animals. In some cases animals may experience minor side effects from Hydroxyzine such as dizziness, drowsiness, nausea or vomiting, blurred vision or dry mouth. Hydroxyzine should be used with caution in animals on medications for glaucoma, heart problems, prostatic hypertrophy, and bladder-neck obstructions. Hydroxyzine HCl tablets are available by prescription and used by veterinarians for the treatment of allergies in dogs, cats, and horses. Typical dose is 1mg per pound in dogs every 6 to 8 hours, for cats 5 to 10 mg per cat every 8 to 12 hours. Always follow the prescribed amount given by your veterinarian. Hydroxyzine HCl may cause drowsiness or dizziness.